This Tractor with Trailer Set is the ideal expansion for the Schleich farm and can be combined perfectly with the hay conveyor (both sold separately). The movable front loader with functioning shovel makes it child's play to load the hay bale onto the trailer and then transport it to the farm. The horse box can be tilted to the sides and backwards. This fun set includes a tractor, a trailer, a front loader that attaches easily with a clip, a farmer, a calf, a large round bale, and 2 sticker sheets. Ages 3 and up. A perfect expansion for the Schleich Farm World range! The tractor can drive through the gate of the farm and the trailer fits under the silo, allowing it to be filled with feed. 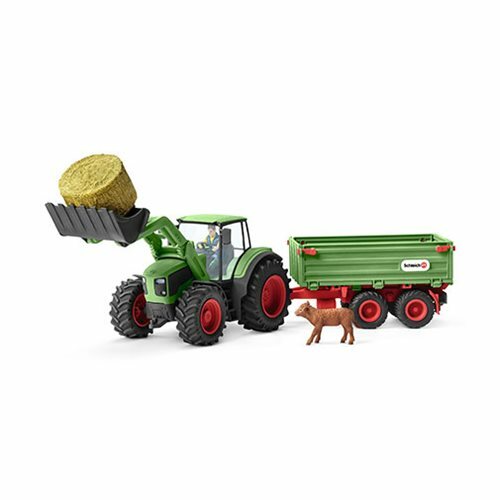 In addition, all Schleich trailers can be connected to the tractor using the trailer coupling! Farm, silo, and trailers sold separately.